Specialists in mineral materials, les Marbreries de la Seine collaborates with the greatest interior designers, decorators and designers in the world. Experts in mineral engineering, they respond to the most demanding requests thanks to an exceptional know-how and an unparalleled range of materials with more than 600 references exposed in their 750m² showroom. Passionate about this thousand-year-old material, les Marbreries de la Seine are always looking for exceptional and unknown products all over the world. 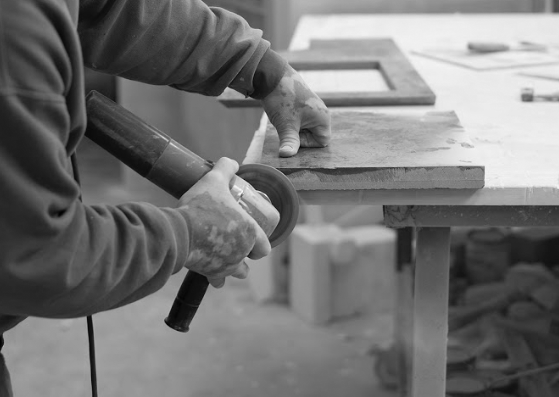 They have been specialized in stone and marble for three generations and the company is above all a family business, currently leaded by Jean Pascal Morvidoni. The work of mineral materials requires a unique know-how and a perfect mastery of the most advanced techniques to sublimate them: shaping, cutting, grooving, drilling, laying and finishing. The expertise and mastery of mineral materials of the artisans of Marbreries de la Seine reveal the beauty of a space to open it to a new dimension. Because stone is an essential reference material combining nobility, beauty and ecology, our philosophy is to build it at its highest level. To make each project unique, they select the rarest, most surprising and most unusual stones. The company was founded in 1985 by Mario Morvidoni, the father of the current leader Jean Pascal Morvidoni, in the town of Les Pavillons-sous-Bois. With a staff of 25, it offers high-end services for both public and private spaces. Les Marbreries de la Seine combines their craftsmanship and their love of matter with the most advanced technologies of modernity. Their perfect knowledge of the raw product, the art of transforming it and implementing it, allows them today to be recognized as a major player in their sector of activity. The philosophy of Les Marbreries de la Seine is to always aim for perfection by combining nobility and purity of materials to create unique projects sublimated by stone. Le Crillion reopened in 2017 and presented its newly designed space. For example, the corridors are covered with a walkway of more than 30.000 marble leaves. Marbreries de la Seine was involved in this major project and has, to name only one example, renovated most of the bathrooms. 2014 Marbreries de la Seine realized in collaboration with architect Isabelle Stanislas an amazing room with furniture made out of marble. The floor, treated with the same materials, evokes the concept of the furniture elements and enhances the elegant and modern inclination of the space.